· BLOCK THE EXPLOSE OF SOLAR LIGHT: The shape of the hood is designed to block excess sunlight from your DJI Mavic Pro camera, without reducing the freedom of movement of the gimbal. · PERFECT FOR CONSTANT SHOTS: You will get the best results with constant and slow flight. We do not recommend flying fast or using sports mode. 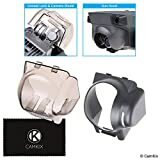 · Sun canopy + 2in1 Gimbal lock and CamKiX camera shield for DJI Mavic Pro Install the 2in1 Gimbal lock and camera shield for DJI Mavic Pro want to transport your drone remove it when you want to fly it. The locking of the cardan in a fixed position prevents it from being forced, rotated, shaken and moved. The shape of the hood is designed to block excess sunlight from your DJI Mavic Pro camera, without reducing the freedom of movement of the gimbal. You will get the best results with constant and slow flight. We do not recommend flying fast or using sports mode. Other CamKiX accessories are available to improve video, improve handling or further protect your DJI drone. Contains: - 1x Sun canopy for DJI Mavic Pro (grey) - 1x 2in1 Gimbal lock and camera shield for DJI Mavic Pro (transparent grey) - 1x CamKiX cleaning cloth If for any reason you are not satisfied with any CamkiX product, please feel free to contact us. We take full responsibility for the quality of our products and will do our best to solve your problem quickly and efficiently! Camkix-USPTO # 86127507- is a trademark and protected by the U.S. Trademark Act. CamkiX products are sold only by authorized sellers.